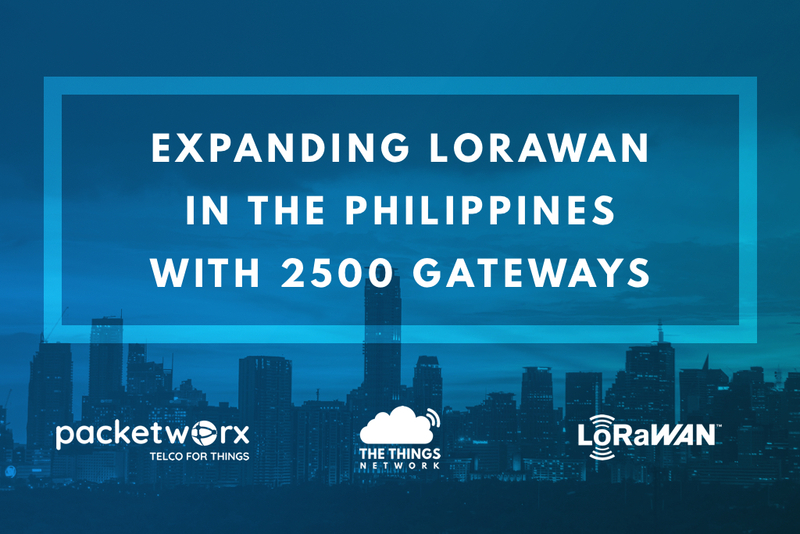 ORTIGAS CBD, PHILIPPINES JULY 10, 2018 - Packetworx, a leading Internet of Things (IoT) company in the Philippines, is officially hosting a regional LoRaWAN™ network for Philippines and Southeast Asia, managed by The Things Network (TTN). TTN is the largest community of startups, businesses and developers globally, building a public IoT data network. The partnership with TTN will promote Packetworx’s major enabling initiatives in the region along with quick deployment of the LoRaWAN network to facilitate a community of innovators. LoRaWAN networks are designed to connect devices such as sensors that communicate over large distances at very low power usage. These smart devices allow for the creation of disruptive solutions for industries like manufacturing, smart cities, buildings and agriculture. Filipino and Southeast Asian innovators can now develop and deploy IoT solutions on a secure network with over 4,100 gateways connected globally. Collaboration and learning among IoT innovators will further be accelerated through developer tools and resources such as the forum, local communities, open sourced repository for tutorials, and the LoRaWAN Academy. Packetworx's mission is to accelerate the adoption of IoT in The Philippines. We’d like to encourage Filipinos especially our young innovators, makers, and enthusiasts to create and develop their own IoT solutions. Our collaboration with The Things Network (TTN) makes onboarding of IoT devices, applications, and solutions easier than ever. The partnership with Packetworx brings forward many new use cases along with the adoption of LoRaWAN technology across The Philippines and Southeast Asia. With such high interest coming in from the region, The Things Network will gain a strong presence in Asia and we look forward to expanding the network with the ecosystem further. TTN’s network is known for supporting thousands of gateways around the world, routing millions of packets daily. It is now available in the Philippines and the further Southeast Asia region with Packetworx. The data exchange between public and private LoRaWAN networks with peering will create one massive grid, intended for all type of use cases - ranging from bootstrapped prototypes to large scale production deployments. This network is expected to grow in the next couple of months with Packetworx’s goal to cover 90% of the Philippines via deployment of an additional 2500 gateways, accessible to anyone. Packetworx is a technical social enterprise which focuses on enabling IoT in the Philippines. It is a member of the LoRa Alliance™, a world-wide alliance of over 500-member companies that support the standardization of LPWAN with the LoRaWAN specification and has created a certification and compliance program to ensure interoperability among its members. The Things Network is a global community of over 40 000 active IoT developers from over 97 countries around the world bringing together startups, developers, businesses along with universities and governments in building a public IoT data network. It is based on the technology called LoRaWAN which is perfect for connecting devices as it is low energy, long range and low bandwidth. Because the costs are very low, people no longer have to rely on large telco corporations to build such a network. Instead, they can build the network themselves.